In model-driven software engineering, model transformations play a key role since they are used to automatically generate and update models from existing information. However, defining concrete transformation rules is a complex task because the designer has to cope with incompleteness, ambiguity, bidirectionality, and rule dependencies. In this paper, we propose a vision of Constraint-driven Modeling in which transformation is used to automate the generation of model constraints instead of generating entire models. Three illustrative scenarios show how this approach addresses common transformation issues and how designers can benefit from using model constraints and guidance. We developed a proof-of-concept implementation that covers an important part of this vision and thus demonstrates its feasibility. 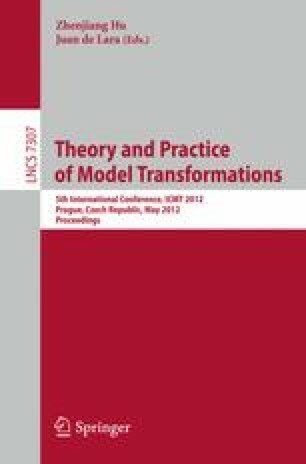 The implementation also suggests that a constraint-driven transformation is efficient and scales even with increasing numbers of involved models.